During your stay at the Candleberry Inn you will find many places to eat throughout Brewster, MA. Restaurants in Brewster, MA range from fine dining to casual dining, and they offer a wide range of cuisine which is sure to fit everyone’s needs. Candleberry Inn is conveniently located to many dining options throughout Brewster, including casual eateries or elegant restaurants. Whatever it is you’re craving, Cape Cod is sure to have it. Restaurants in Brewster, MA feature diverse menus with authentic cuisines and locally sourced food. 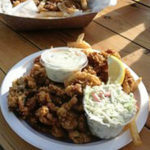 Seafood cuisine and authentic Mediterranean dishes are some of the great dining options you have here in Brewster, MA. Choose to eat at one of the many restaurants in Brewster, MA that features four course dining or enjoy a casual meal with the family at a café on the harbor. Brewster, MA is home to some of the best seafood establishments, featuring fresh catches. If you’re interested in places to eat in Cape Cod that feature fresh seafood dishes, there are plenty of restaurants to choose from. Broiled lobster, fried oysters, fresh scallop rolls, and clam chowder only skim the surface of seafood menu selections in the area. Each restaurant you find in Cape Cod takes the time to ensure its guests have a memorable and enjoyable experience at their establishment. Take a look at some of the restaurants in Cape Cod and Brewster, MA below.